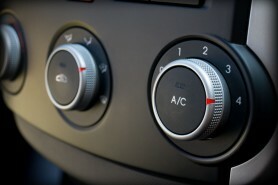 Cadnam Garage Services in Cadnam, Southampton offers a full air conditioning service. If you want a quote or need more information, please contact us today! We don’t want you to have to spend a fortune on the air conditioning in your vehicle. Before replacing anything, Cadnam Garage Services mechanics will do a full check to find out where the problem lies. It may just be that the vents are blocked, or that the system needs re-gassing. The only time we will replace anything is when it is really necessary. At Cadnam Garage Services, we have some of the best trained mechanics. They are able to work on all different makes and models. If you have any special requirements, feel free to contact us beforehand and we will make sure we can meet your needs. Our mechanics have worked on air conditioning systems for a wide range of vehicles. Cadnam Garage Services believes that the customer comes first. Our air conditioning specialists will talk you through the problem and will only replace items that are necessary. For a full vehicle air conditioning service in Cadnam, Southampton, please contact us today for a quote or more information.